Balancing robots – for dummies? Balancing robots are those, which can maintain balance by themselves. And how it looks? For example like this. Author of the robot above began a interesting thread on Arduino forum: Balancing robot for dummies, where he promises to describe everything in a simple and aproachable way. 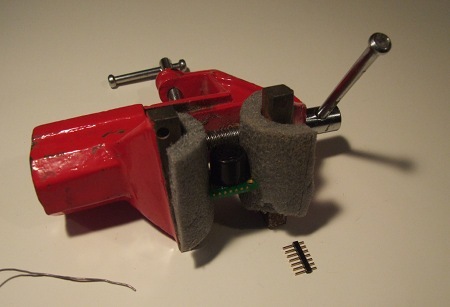 If you are interested in this kind of robots – trace this thread with attention. 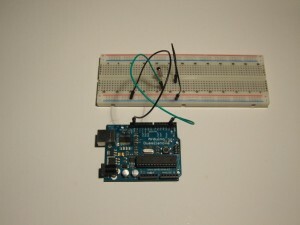 Posted bymarkal 2010/10/20 2010/10/20 Posted inarduinoTags: arduino, howto, robotLeave a comment on Balancing robots – for dummies? You see that vortex? It’s officially called LCD kits testing station. Just after soldering a module it needs to be connected and examined, if it lights and displays everything properly. There could be a silly text, but it would be too simple. Therefore among this cable clutter is hidden temperature sensor MCP9700 (actually two) and the LCD simply displays readings from it. Last night I somehow became interested in the temperature Arduino was displaying. It was definitely too high. The difference between 21 and 24 degrees is well distinguished by everyone (the photo was taken at other temperature conditions :) ). There’s no way to blame inaccuracy of measurement for it, because the sensor yet has +/- 2 deg. accuracy. Moreover, once or twice during a talk with my clients I heard opinions that the sensor shows too much. For this reason I began to grub around and try variety of things. 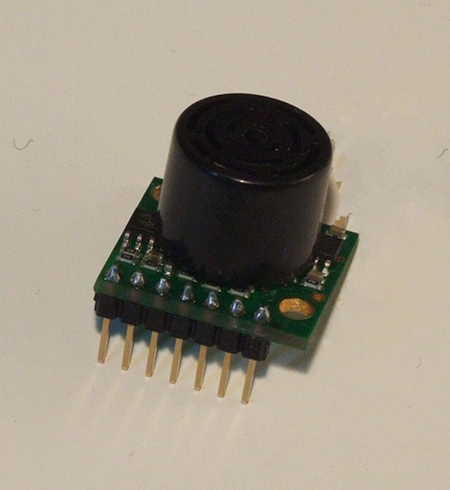 Analog-digital converter is fully described in ATmega328 datasheet on page 250. In a nutshell: AREF voltage is the voltage powering DAC converter (digital controlled voltage divider) which output is connected to a comparator matching AREF to the voltage on a certain analog input. DAC voltage “starts” from zero and increases until it not excesses measured voltage level. Thanks to it the measured voltage value is known. Accuracy of such a measurement stands out from the very beginning. The first thing is resolution (in bits) of DAC. In other words – with which step the voltage is increased. 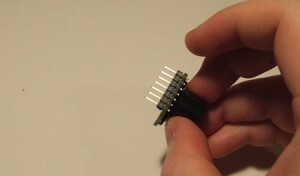 ATmega328 has a 10-bit one. The second value is AREF voltage. When the number of steps is defined (1023, because of 10 bits), the voltage per step is known. It’s AREF/resolution. 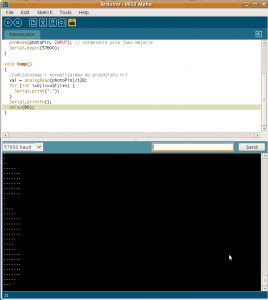 ATmega can utilize 3 different AREF sources. 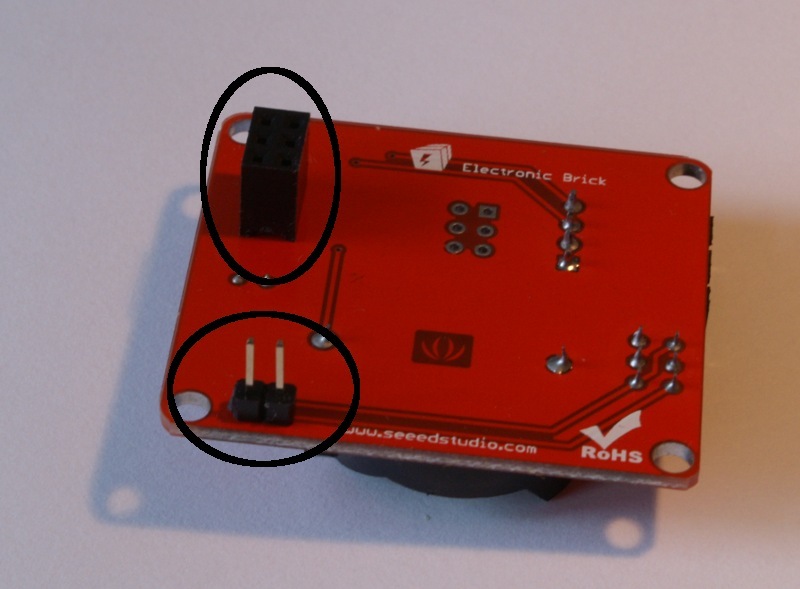 It could be internal 1.1V source (don’t know the accuracy), supply voltage (about 5V) or a value given to AREF pin. Knowing this value is essential to convert digital reading from A/D to a real voltage value. Let’s skip the internal 1.1V source and external 5V AREF for now. We will focus on default AREF value – 5V. 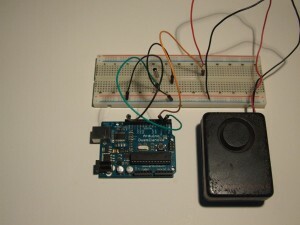 Now, basic knowledge about MCP9700 sensors, exactly about sensitivity, would be useful. It equals 10 mV/deg., so if we want to read what exactly the sensor emits, we have to know the AREF value precisely. Reading from analogRead() has given us 150. We think that the voltage read is 5/1024*150 = 0.7324 V. It’s true, but if AREF equals 5V in fact. And what if it’s 4.9V? Then the real value meant by reading of 150 equals: 0.7178V. The difference – 14.6 mV. For the sensitivity of 10mV/deg. – almost 1.5 degrees! And how much exactly AREF equals in default setup? Supposedly 5V, but in fact Vcc (supply voltage) provided to ATmega328. 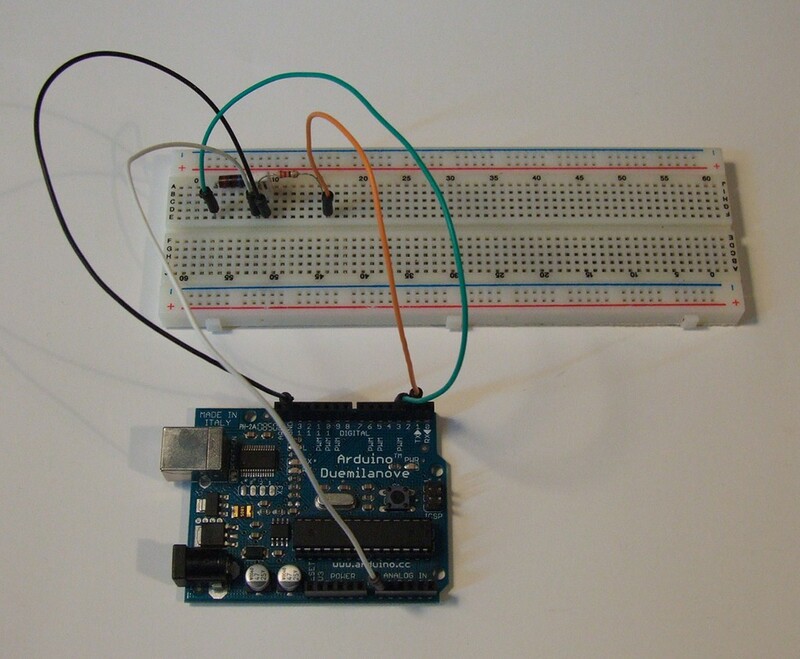 Wait, someone could say Arduino has built-in 5V voltage regulator, so such a high difference shouldn’t exist. 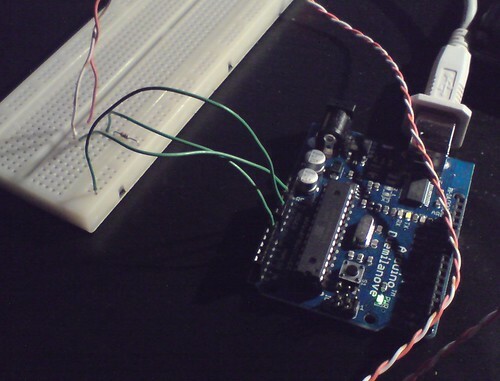 It’s true, but only when Arduino is powered by external source, not USB! As is well known, USB standard tells that supply voltage is 5V, so the voltage regulator doesn’t work, the voltage from USB goes directly to ATmega. The regulator doesn’t work because it needs suitably higher voltage in order to have a “reserve”, so it’s technically impossible to maintain 5V while voltage supplied to the regulator also equals 5V. In other words, we have to rely on what the computer provides on USB. And here I became suprised, because my notebook gives 4.9V instead of 5V on USB. Finally – because of that my reading was increased by those 1.5 degrees. However, when using analogReference(INTERNAL) we will abandon upper ranges of the reading (because maximum reading is 1.1V, what after converting to temperature gives (1.1-0.5)/0.01 = 60 degrees) in order to increase readout accuracy (1.1/1024 = about 1mV – 0.1 degree). Note once again – it’s increasing readout, not mesurement accuracy :) . 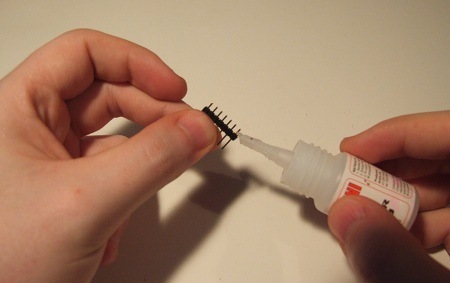 That was briefly about what exactly analogRead measures. And, in order to explain why on the photo one readout is 18 degrees, while the another – 10. 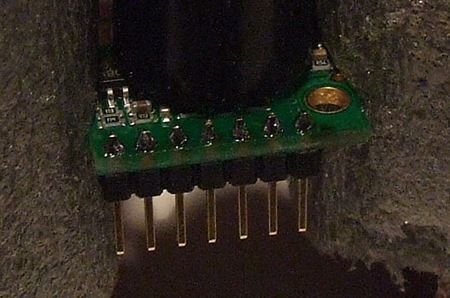 This isn’t a trick with analogRead – one of the sensors is MCP version A, the another – regular MCP. 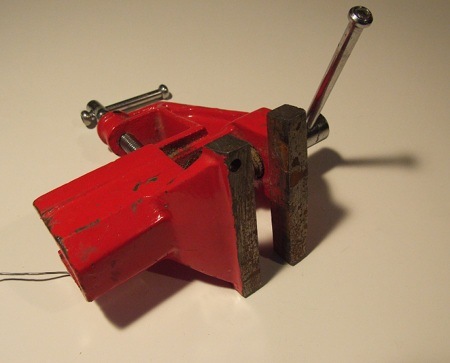 The one with “A” (supplied with Starter Kit and also sold separately) has +/- 2 accuracy, without “A” – +/- 4 degrees. Posted bymarkal 2010/10/20 2010/10/20 Posted inUncategorizedLeave a comment on What analogRead() actually measures? Every amateur and professional meteo station requires humidity sensor to be completely happy. 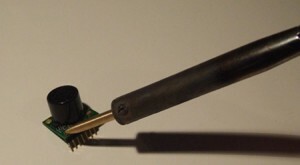 This sensor along with a termometer allows to forecast so called “dew point”. Dew point is a temperature at which (and at a certain humidity) vapor water condenses into water. Usually it produces dew on grass, but in specific conditions also allows to calculate cloud base or figure out why in the kitchen plaster falls out from the ceiling ;-). 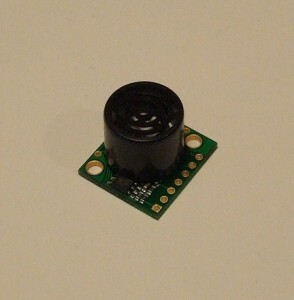 HCH-1000 available in Nettigo is a capacitive humidity sensor. 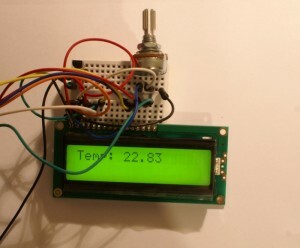 Capacitive means that the sensor is a capacitor, which capacitance proportionally depends on the humidity. Average value is about 330 pF. 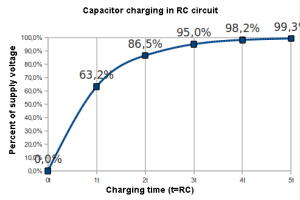 Capacitor is, in a simple explanation, an element which stores electric charge, or even simpler (electronics engineers – please forgive me) – some kind of very low capacity accumulator. 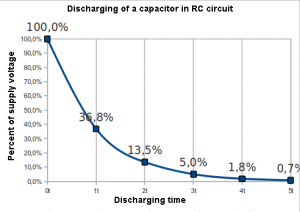 Everyone, who had anything to do with an accumulator (even in a mobile phone) know that charging and discharging it takes certain amount of time. This amount depends on capacitance of the accumulator and its electric demand. The same rule concerns capacitors. 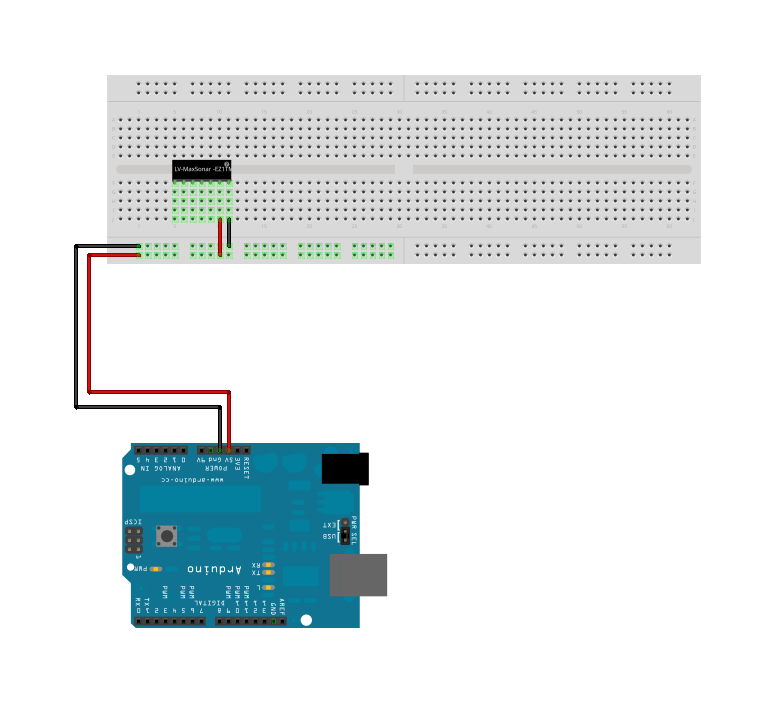 Professionally, it’s called RC circuit (because it consists of a resistor and a capacitor connected serially). t = 10 * 10^6 Ω * 330 * 10^-12 F = 10 * 330 * 10^-6 = 3300 * 10^-6 = 3300 µs. 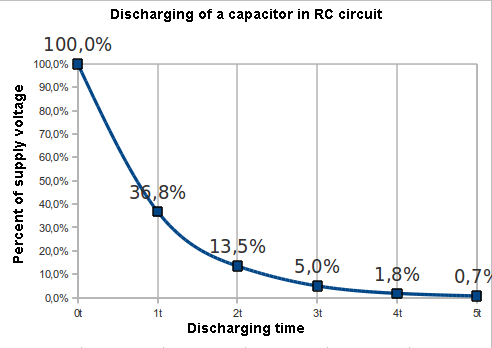 Charging to higher parts of the supply voltage is, according to the chart, multiplication of this time. For example, for 95% it takes 3 times longer. The following picture shows a connection diagram of the basic model. Pin 3 is responsible for charging the capacitor, pin 2 for discharging. 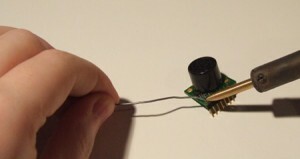 Analog pin 0 measures voltage drop across the capacitor. To pin 3 is attached to a chrging resistor 10 MΩ, To PIN 2 – discharging resistor 220 Ω.
Capacitance measurement procedure is composed of two consecutive subprograms. 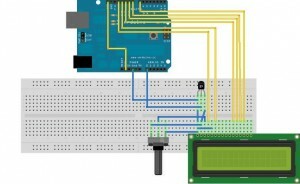 In Nettigo recently appeared LCD kit for Arduino – it is 2×16 alphanumeric LCD with soldered connector fitting to a breadboard and 10 kΩ linear potentiometer for contrast regulation. The LCD module has HD44780-compatible controler, what means LiquidCrystal library will be able to handle it. How to connect it? After that, in loop we are reading temperature form MCP-9700 (described in this post). Having the temperature already, we are showing Temp: text and the reading, and going back to the beginning. 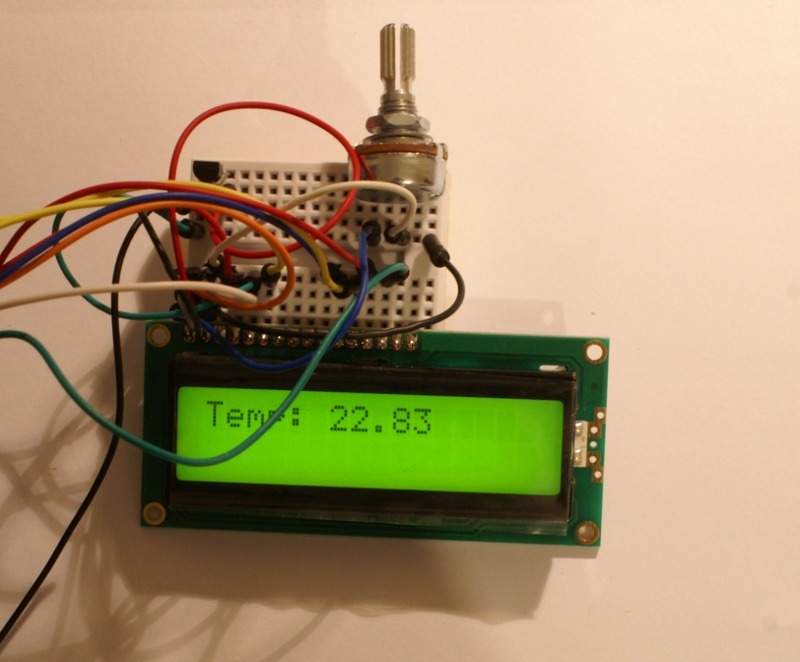 How to improve the temperature measurement? 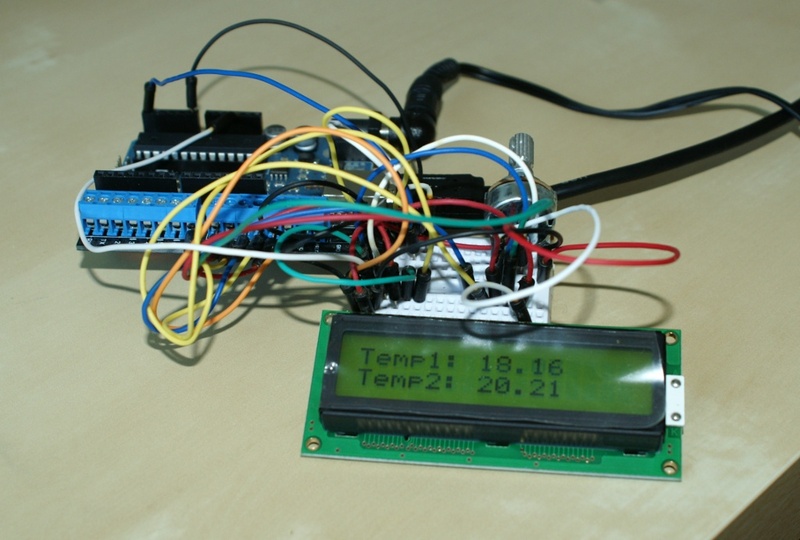 Temperature reading (in form of voltage measured by analog input 0) is given by MCP9700 with accuracy dependent on voltage converter in Arduino. It’s 10-bit and measures voltage from 0 to 5V by default. 10 bits mean that we have 1024 steps in voltage reading. Thus, the voltage is measured with 4.88 mV (5/1024) resolution. 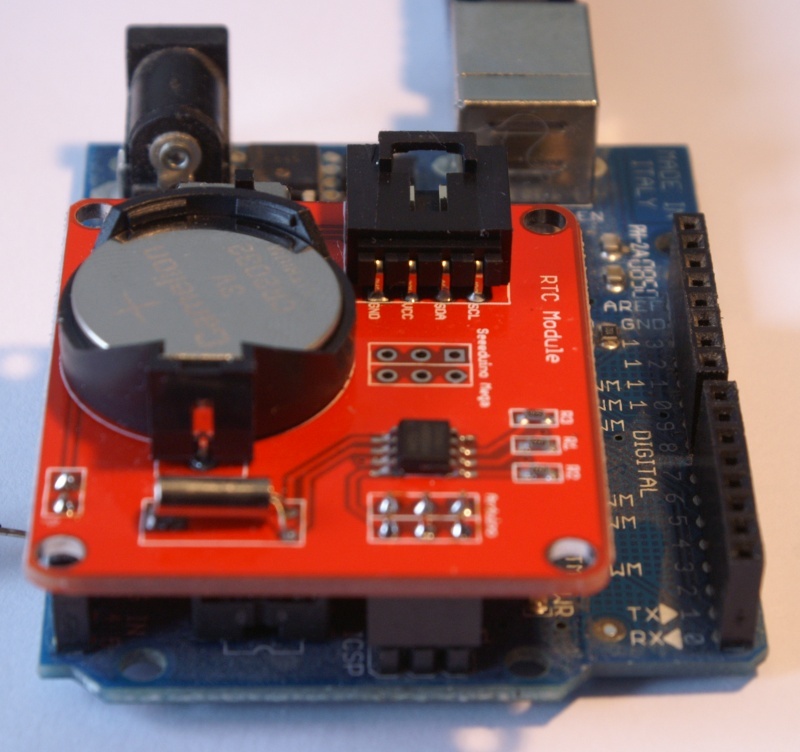 MCP9700 sensor has 10 mV / degree resolution, so it virtually means that we have 0.5 degree accuracy (it’s not about sensor’s quality, it’s about how Arduino measures the voltage). Potential risk. According to the reference of analogReference function, the default setting (when analogReference isn’t invoked at all or invoked with DEFAULT value) could damage the microcontroller on Arduino board when using external AREF! 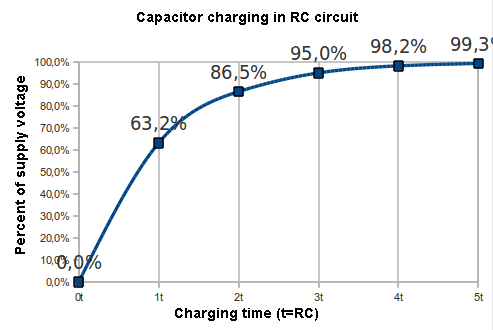 MCP9700 datasheet shows that maximum output voltage is 500 mV+ 125*10mV = 1.75V. It would be best to force the converter to measure voltage in range 0-1.75V, but it requires to add a voltage divider. This is not difficult, but in order not to complicate, we will use a simple measurement quality improving method, without any additional elements. 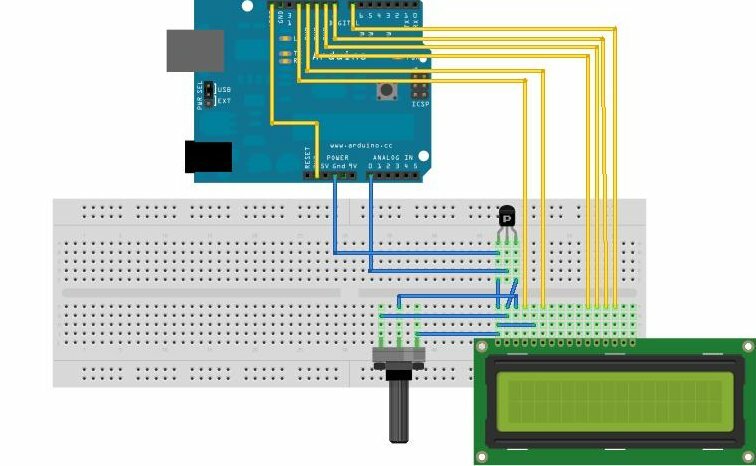 We will exploit the fact that Arduino provides a 3.3V voltage, apart form 5V and we can improve measurement resolution without any problems. Because of this in setup the analogReference(EXTERNAL) (it’s not enough to supply a voltage to AREF) function is invoked and in loop the tempreature calculating formula is changed. After changing the reference voltage we have 3.2 mV step, which means the temperature is measured with 0.3°C accuracy and not 0.5°C, like before. Arduino hasn’t internal clock. It means some operations connected with time (delaying for specified interval) are possible, but date and time controlling isn’t so easy. 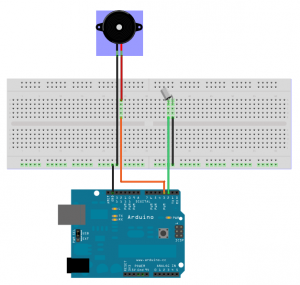 To let Arduino know, what time is it exactly, there is external clock device needed. Such a device is Dallas DS1307, available on Nettigo.eu in form of Arduino-connectable module. 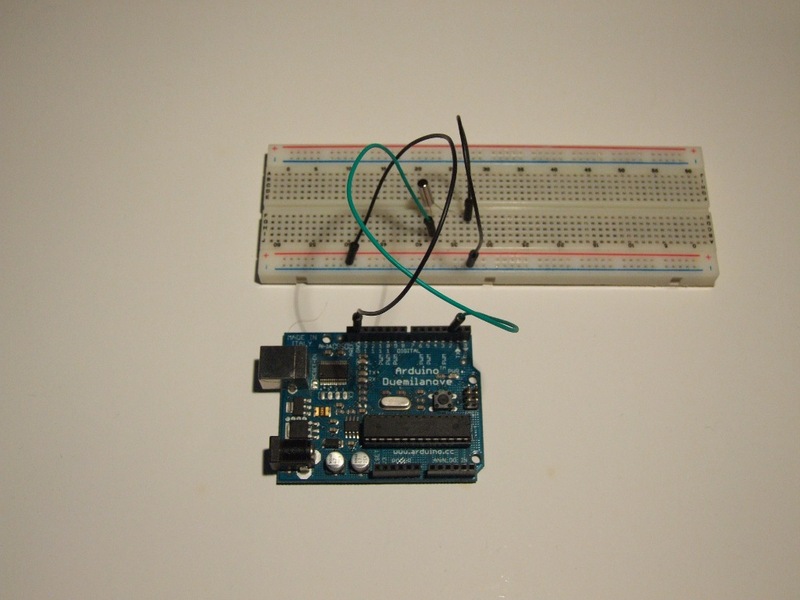 This module has a battery back-up, so once set, the time isn’t deleted after shutting Arduino down. In the left upper corner there is 4-pin header socket with 2.54 mm raster. Unfortunately we still haven’t cables for this socket in stock. 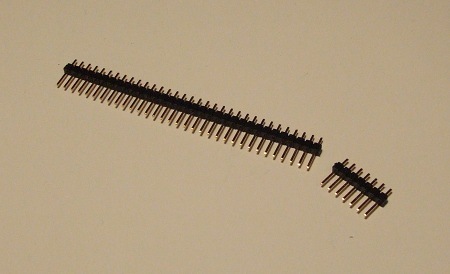 You have to scare it up or connect through ICSP socket using goldpins. 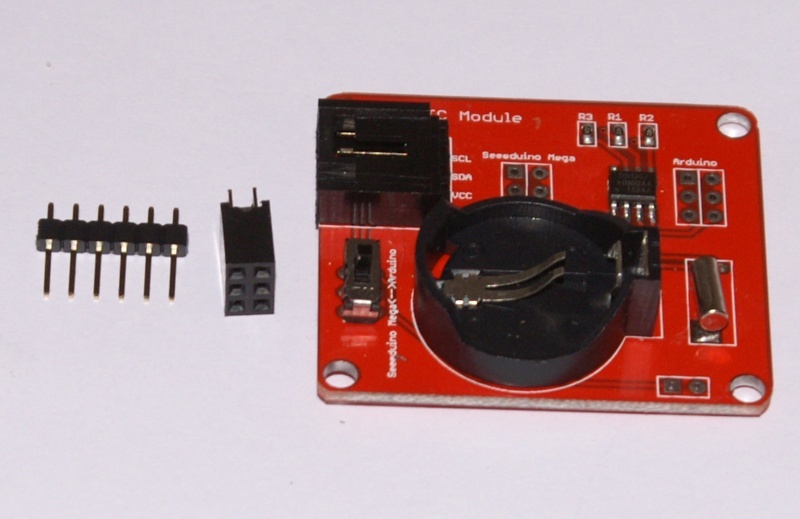 Those elements are provided with the module, but need soldering (simple even for beginners). 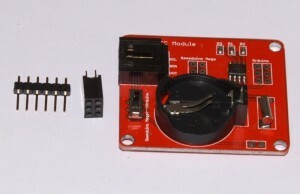 Using the cable we can connect the module to any controler supporting I2C protocol. 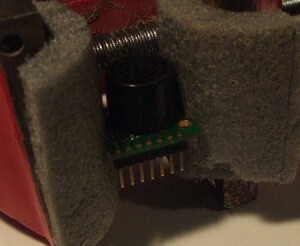 ICSP socket (from which the module is powered) has two positions to which it could be soldered. The first is for Arduino Duemilanove and its clones (taking pinout and size into account) or Seeeduino Mega. 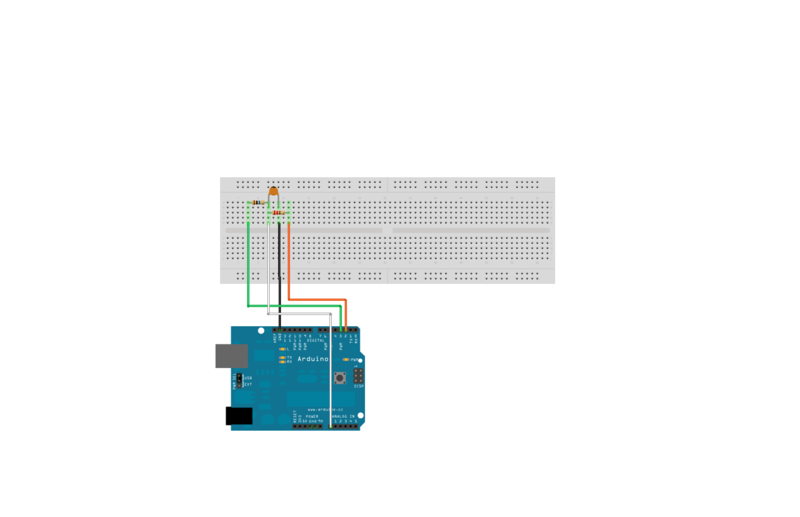 With such a connection the module is incompatible with Arduino Mega (relative position of ICSp pins and I2C bus output is different). 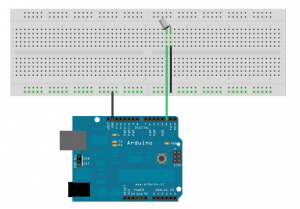 Arduino’s eye – sounds like a quote from J.R.R. Tolkien, while it’s about connecting photoresistor to Arduino. With this article I would to begin short course dealing with basics of electronics. Photoresistor is a element whose resistance is dependent of amount of light falling on it. What only remains is to measure this resistance. In which way? For a playful use we will ignore accuracy, assuming simplified model. 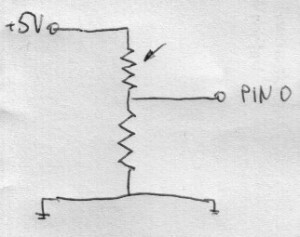 What is depicted here is so called voltage divider. You can read on Wikipedia, how it works. Briefly speaking, voltage on the junction point between two resistors will be varying according to resistance of the photoresistor. And this is what we will be measuring with our program. While the program is running, I’m covering the photoresistor with my hand, changing its resistance, and thus the voltage being read by Arduino from pin 0. The number of dots is proportional to the reading. Coming soon – how to physically show varying reading.